Police in Brazil have arrested at least 70 people suspected of illegal logging in the Amazon - including officials employed to protect the rainforest. Several environmental officials in Mato Grosso state are accused of providing false licences for the extraction of timber from protected areas. Loggers, landowners and forest managers have also been charged. Police estimate that the illegal logging operation has caused damage amounting to about $500m (£345m). The arrests followed a two-year investigation in six Amazon states. Much of the timber was taken from national parks and protected indigenous territories. Officials in the environmental secretariat of Mato Grosso are accused of providing false documents that helped the loggers avoid controls on illegal deforestation. 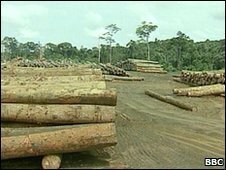 Under laws designed to protect the rainforest, timber companies in Brazil require certificates to show their logs come from an approved source. Mato Grosso, in the southern Amazon, is one of the regions worst affected by forest clearance, mostly for expanding soya farms. Brazilian president Luiz Inacio Lula da Silva says his government has significantly reduced the rate of Amazon deforestation as part of its strategy to combat climate change.